In search of his third double-double, the combination of Indian Wells and Miami Open trophies, Novak Djokovic took another step forward today in beating Steve Darcis 6-0, 7-5 to move into the round of 16. There is not much to discuss about an opening set, where the world number one posted a bagel against his peer. After Djokovic seized seven successive games, Darcis at last made his presence felt in the second set. The 31 year old qualifier, in his maiden third round at the Miami Open, overcame three break points before holding serve for 2 all. As Djokovic continued to push, Darcis again was made to work to level the score in the sixth game. The possibility of a third set became imminent as the Belge broke for 5-4 and had the opportunity to steal a set. However, the four time champion was in no mood for a decisive set. Djokovic took the next three games to dash any of his rival’s hopes. Next, Djokovic takes on Alexandr Dolgopolov. A quarterfinalist in 2014, the Ukranian defeated Thomaz Bellucci in straight sets. In the opening match of the grandstand, Kei Nishikori needed only 63 minutes to send off Viktor Troicki 6-2, 6-2. 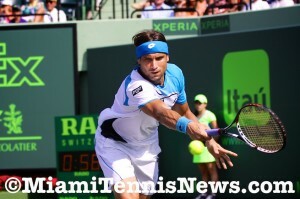 Also in action was Spaniard David Ferrer. The 2013 finalist took care of Lukas Rosol 6-4, 7-5 and will duke it out with Gilles Simon for a berth in the quarterfinals. Milos Raonic outlasted Jeremy Chardy 6-1, 5-7, 7-6. Raonic will find John Isner across the net. The American ousted Grigor Dimitrov the ninth seed with a 7-6, 6-2 triumph. 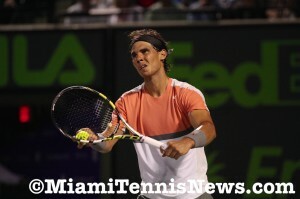 Rafael Nadal passed his first real test of the Sony Open Tennis tournament with a 4-6, 6-2, 6-4 victory over Milos Raonic during semifinal action on Thursday night. Nadal held his last nine service games and won 20 of 24 service points in the third set before advancing in two hours and 35 minutes. Raonic had never taken a set off Nadal in four previous meetings and the underdog was going up against an opponent who had dropped a mere nine games in his first three Miami matches. Still, Raonic showed plenty of belief. The 6’5” Canadian saved all three of the break points he faced in the opening frame of play and clinched it when Nadal double-faulted down set point at 4-5. From there, however, it was all Nadal. The top-ranked Spaniard surged to a 4-0 lead in the second set and earned the decisive break at 3-3 in the third. Next up for the No. 1 seed is Tomas Berdych, who got the best of Alexandr Dolgopolov 6-4, 7-6(3). Berdych fired 11 aces and battled back from a break down in each of the two sets as he prevailed in one hour and 45 minutes. Dolgopolov, an Indian Wells semifinalist, was doomed by 48 percent serving and just 35 percent of his second-serve points won. Berdych is now 4-0 lifetime against Dolgopolov, but the story is a much different one against Nadal. The Czech trails the head-to-head series 17-3 and has lost 16 consecutive matches. A rematch of this year’s Australian Open title match in the semifinals of the Sony Open Tennis tournament is looking more and more likely with each passing round. Rafael Nadal took care of Denis Istomin in round-of-32 action on Monday and Stanislas Wawrinka beat Edouard Roger-Vasselin, also in straight sets. Nadal was especially ruthless. The world No. 1, whose Aussie Open final setback against Wawrinka was one of just two losses for him this season compared to 19 wins, destroyed Istomin 6-1, 6-0 in just 59 minutes. Nadal struck three aces without double-faulting, served at 77 percent, and saved all three of the break points he faced. Wawrinka, whose last event also saw him tumble out of Indian Wells–like Nadal–prior to the quarterfinals, scored a 7-5, 6-4 victory over Roger-Vasselin. The third-ranked Swiss broke serve at 6-5 in the first and 5-4 in the second to wrap up both of the sets in style. John Isner, the United States’ last hope even before the third round started, had little trouble from start to finish against Nicolas Almagro. Isner fought off two break points in the opening set but for the most part held serve comfortably the entire way in a 7-5, 6-3 win. The world No. 10 blasted 17 aces, put in 70 percent of his first deliveries, and lost only five points in five second-set service games. Isner will face Tomas Berdych during a terrific fourth-round lineup on Tuesday. 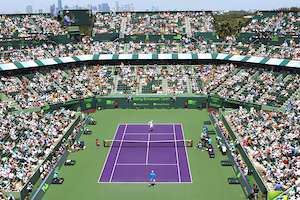 Other matches include Nadal vs. Fabio Fognini and Wawrinka vs. Alexandr Dolgopolov. Almost nothing has come easy for Rafael Nadal in 2014. 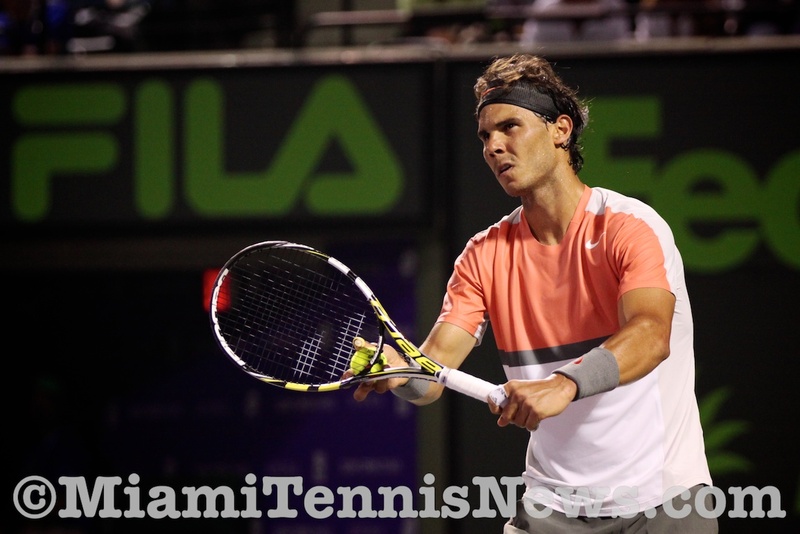 But that is exactly how he made it look on Saturday night at the Sony Open Tennis tournament. Nadal began his week in convincing fashion as he rolled over Lleyton Hewitt 6-1, 6-3 in one hour and nine minutes. The world No. 1 converted four of five break points and faced none on his own serve during the second-round blowout. Hewitt, the Brisbane champion from earlier this season, lost the first four games of the match before finally holding serve. The 33-year-old Australian eventually had a game point at 3-4 in the second only to lose three straight points and get broken. Nadal dropped only eight points in eight service games and he wrapped up the proceedings with one last routine hold at 5-3. The Australian Open runner-up, who lost to Alexandr Dolgopolov in the Indian Wells third round, will go up against Denis Istomin on Monday. Istomin reeled off nine games in a row from the start of the second set to 3-0 in the third during a 6-7(8), 6-3, 6-0 win over Dmitry Tursunov. Istomin crushed 19 aces and benefited from 14 double-faults by his opponent, against whom the Uzbek is already 3-1 this year. In what is becoming old habit for John Isner, the 6’10” American is his country’s last hope on the men’s side. Isner is the only player flying the USA flag in the third round after he battled past compatriot Donald Young 6-7(5), 6-3, 6-4 in one hour and 55 minutes. A back-and-forth match saw the world No. 10 lose the opening tiebreaker before seizing a break early in the second. Isner gave it back at 4-2, but Young dropped serve again at 3-4 to let Isner close it out one game later. A quick break in the third ultimately decided the outcome in Isner’s favor. Next up for Isner is Nicolas Almagro, who eliminated another American in Sam Querrey via a 6-4, 6-4 scoreline. The first men’s semifinal at the Sony Open showcased a pair of thirtysomething. World number five David Ferrer outlasted a resurgent Tommy Haas 4-6, 6-2, 6-3 to reach his fifth Masters 1000 series final. At 35, Haas, a former world number two, discovered his fountain of youth. Ranked 18th, the German ousted 24 year old Alexandr Dolgopolov in the third round then stunned world number one Novak Djokovic in the round of 16. 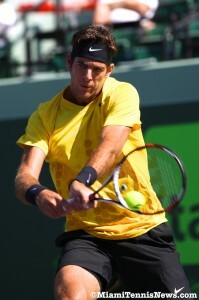 This year’s semifinal showing was the furthest Haas’ had advance in Miami. In a day session which progressed into the evening, Rafael Nadal prevailed over Radek Stepanek 6-2, 6-2 and improved his mark to 6-0 versus the Czech. Despite the score, Stepanek was not a comfortable put away for Nadal using everything in his bag of tricks to disrupt the Spaniard. At one all in the first set, Stepanek forced Nadal to overcome break point in order to hold. After failing to build on a 15-30 advantage on his rival’s serve, Stepanek was broken when Nadal connected on a forehand crosscourt pass for a winner. Next, Nadal consolidated for 5-2. Then, Nadal broke Stepanek a second time to bed the opening set. Following a hold where he wiped out break point, Nadal converted to secure the break. In spite of Stepanek fighting, Nadal went on to stretch his lead to 3-0. For the second successive week, Juan Martin Del Potro found himself in the final of an indoor event. In his debut at the Open 13, Del Potro held off unseeded Frenchman Michael Llodra 6-4, 6-4 to bank his initial title of the season and the tenth of his career. After seeing Richard Gasquet bounced in the quarterfinals and top seed Jo-Wilfried Tsonga ousted also by Del Potro in the semifinals, the crowd was hoping that Llodra would be the hometown favorite to ultimately halt the Argentine. With world number two Novak Djokovic prevailing over world number one Rafael Nadal at the last two Masters tournaments, the clay universe’s order of the past six seasons has been thrown into chaos. Djokovic could upstage Nadal on his home turf and yank away the number one ranking from the Spaniard. The French Open draw has been released and by far, the top two players are the favorites. However, with seven rounds to be disputed prior to someone being awarded the trophy, any number of persons can trip Nadal or Djokovic. Here’s a more detailed look at the draw. Although his performance has been patchy this year, Nikolay Davydenko has a 6-4 record against Nadal. With ten titles on clay including one recently in Munich, Davydenko, the twice semifinalist at Roland Garros, is a formidable potential challenger for Nadal in the round of 16. Despite a downward slide the last two months, Robin Soderling can at any time regain the form which brought him three consecutive titles early this year. As such, the two time French Open finalist, the only person to defeat Nadal at Roland Garros, could be a serious obstacle in the quarterfinals. Rafael Nadal sat down with the media after his fourth round win over Alexandr Dolgopolov. Nadal answered questions about today’s rain delay, the conditions out on the court due to the high humidity and his next round match with Tomas Berdych. Here is his interview with the media. RAFAEL NADAL: So, I mean, I am not presenting alcohol party, you know. It’s a responsible campaign, a social campaign. ​Anyway, I think alcohol is inside our lives, so is nothing new, no? But the campaign is not against alcohol but about be responsible when you go out. ​So wasn’t difficult decision, because I think is very important social campaign, and I believe in this campaign. So it was a very easy decision, because I think is very good thing to do for Bacardi. In the third round at the Sony Ericsson Open, Rafael Nadal faced fellow Spaniard Feliciano Lopez. Nadal eased his way into the fourth round with a solid 6-3, 6-3 triumph. After a few comfortable holds by Lopez, Nadal got the critical break to go ahead 4-3. Subsequent to promptly consolidating, Nadal arrived at triple break point. Although Lopez fought back to deuce, Nadal eventually secured the break to claim the first set. In the second set, with a forehand down the line winner, Nadal manufactured double break point. Nadal then won the next point to take a 4-2 advantage. Again, Nadal quickly consolidated for 5-2. Despite Lopez guarding serve the next game, with a volley that threaded the needle, Nadal had double match point. With a forehand winner, Nadal progressed to the fourth round.